Gates offers a broad range of design products for both basic and complex power transmission drives. Design a two-point drive from scratch, or modify an existing drive integrating Gates technology, with free Design Flex® Pro™ software. For multi-point drives try Design IQ®. All Gates tools are backed by product application engineers available to collaborate on unique design solutions. For more information, visit http://gates.com/ptdesign. In response to the gear market’s need for optimization software, which has been lacking for many years, Excel-Lent gear/gearbox design and analysis software has been developed by Excel Gear (Roscoe, IL) and written in Visual Basic.Net. This thorough and powerful tool was created by engineers who also design and manufacture gears for their own use. With the widespread adoption of composite ice hockey sticks over the past decade, frequent stick breakage is all too common. But Hockey Robotics, with the help of MapleSim software and a hot-shot robot, is aiming to change all that. The rapid chilling of cooked products is particularly beset with challenging temperature parameters that, if violated, can open the door to product contamination. The latest development in chillers for food processors, Lyco Manufacturing's Easy-Flow, represents a quantum shift in cooling speed. Computer scientists and engineers at Harvard University have developed and licensed technology that will make it easy to test collective algorithms on hundreds, or even thousands, of tiny robots. Advanced high-strength steels (AHSS) are the fastest-growing automotive lightweighting material and will be key to automakers as they look to meet tough new emissions standards. Bosch Rexroth has developed a slick new informational tool for engineers and OEM project managers on the go: The Rexroth GoTo eBook. Optimized for iPad, it combines all current GoTo Focused Delivery Program catalogs into an easy-to-use digital format, with added features such as embedded videos, helpful white papers, and links to online Rexroth resources. Rexroth‘s most popular electric drives and controls, hydraulics, pneumatics, linear motion, and aluminum structural framing products are presented. E-reader platforms like the Kindle, Nook, and other systems are also supported. GE researchers are applying 30+ years of experience creating superconducting magnets for MRI systems to design an advanced generator for large-scale wind power. 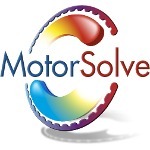 MotorSolve v2.6 includes several new features: synchronous reluctance motor templates, improved loss predictions, and enhanced stator winding modeling with 3D viewing and more accurate end-effect calculations. Motor efficiency can be determined with greater accuracy due to improved loss predictions. Mechanical factors such as friction, windage, and stray losses can now be accounted for. Don’t bust a gut like the guy pictured here. Multi-Jackbolt tensioners from Superbolt make large-diameter bolting safer for workers, reduce installation times, and best yet are super easy — only hand/air tools are required for any diameter nut or bolt. Watch "The Simple Solution To Bolting Problems," then check out the Superbolt 32-page catalog and the application example brochures.